Shri Jitendra heads Reliance Foundation since January 2015. 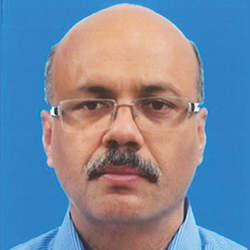 Jitendra has nearly 23 years of rich experience in Development Sector & Indian Civil Services. Prior to joining Reliance Foundation, Jitendra worked as Chief Executive Office of Dr. Reddy’s Foundation (DRF). At DRF, he was leading a team of 700 professionals engaged in livelihood promotion and poverty reduction. During his stewardship, DRF has received various prestigious awards including the ET Corporate Citizenship of the year award and CNBC TV 18’s inclusive India Award. Jitendra has also worked previously with UNIDO as Program Head wherein he had pioneered the ‘Cluster Development’ approach in India. At UNIDO he was responsible for the development of various poverty intensive clusters in the state of Andhra Pradesh, Karnataka, Tamilnadu and Maharashtra. He has also served in the Indian Civil Services for 10 years as an officer of the Indian Railway Accounts Service (IRAS). Jitendra has conducted numerous training programs for cluster practitioners and policy makers within India and abroad. He has provided consultancy and training support to policy implementing personnel in Iran, Pakistan and Turin (ILO). He is also a certified trainer on Arbinger principles.